NAHA, OKINAWA PREF. 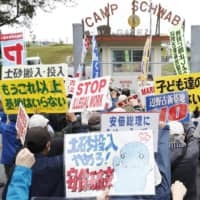 - The government began to perform the next stage of land reclamation work in Okinawa Prefecture on Monday, as part of a project to build a replacement facility for a contentious U.S. air base in the prefecture despite local opposition. The work to pour soil and sand into a new 33-hectare section off the coast of Nago’s Henoko district began in the afternoon, moving the construction plan for U.S. Marine Corps Air Station Futenma into a new stage even though a prefectural referendum last month showed more than 70 percent of residents oppose it. The area in which land reclamation work is being carried out is next to a 6.3-hectare section that started being filled in during December. The landfill work is required in order to relocate the base from Ginowan to Nago. Okinawa Gov. Denny Tamaki asked Prime Minister Shinzo Abe to halt the land reclamation work and engage in a one-month dialogue period when they met in Tokyo last Tuesday, citing the result of the referendum. On Monday, protesters gathered in front of the gates of U.S. Marines’ Camp Schwab, which is adjacent to the construction site, to hold a sit-in demonstration. Others paddled canoes or sailed small boats on waters around the site. The central government plans to reclaim a total of 160 hectares to build a runway in a V-shaped configuration at Henoko. But the seabed was found to be unstable in multiple areas on the eastern side of the site, so requires additional reinforcement work that the Defense Ministry estimates will take three years and eight months to complete. Tamaki, who was elected governor last September on a platform of blocking the relocation plan, has said that such reinforcement work is impossible and that he will not approve the procedural applications from the central government needed for it to proceed. Many Okinawa residents have long hoped that the Futenma base will be moved out of the prefecture as they are frustrated with noise, crime and accidents linked to the U.S. military presence. 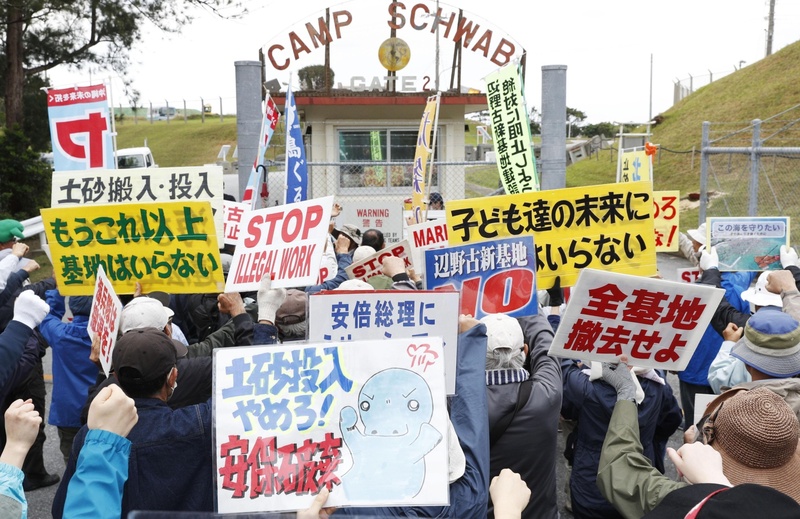 But the Japanese government has said the relocation plan is the “only solution” for eliminating the dangers posed by the base without undermining the deterrence provided by the Japan-U.S. security alliance.